After leaving Google and working in the open source ecosystem for the past few months, it’s become increasingly clear to me which pieces of Google’s infrastructure are ahead of the curve and which are not. One piece that’s clearly ahead is Google’s code review tool. Google’s original code review tool was Guido van Rossum’s Mondrian, which he eventually open sourced as Rietveld, a project which was in turn forked into Gerrit. Mondrian has since been replaced by a newer system at Google but, to my knowledge, this new system has never been publicly discussed. 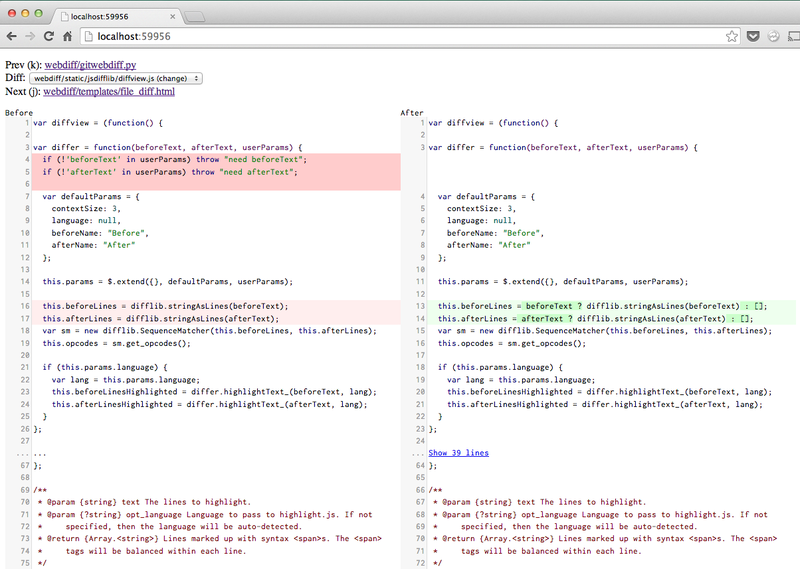 These code review tools all excel at showing side-by-side diffs. The difference between inline and side-by-side (two column) diffs is so dramatic that I refuse to waste mental energy trying to grok the inline diffs that github insists on showing. Many diff tools (e.g. tkdiff) are XWindows programs are clearly out of place in Mac OS X. They often don’t work well with the app switcher and or show high resolution (“retina”) type. Most diff tools want to operate on pairs of files. tkdiff and p4merge show you one file at a time in isolation. Once you advance past a file, you can’t go back. I like to flip back and forth through files when viewing diffs. They typically do not support syntax highlighting. There are certainly diff tools for Mac OS X that do all these things well, but they tend to be commercial. Enter “git webdiff“, my newly-released side project which aims to improve this situation. When you run “git webdiff”, your browser will pop open a tab with this UI. When you’re done, you close the tab and the diff command will terminate. It works quite well any time you have an even remotely complex diff or merge to work through.